A Shropshire riverside pub is to use a ferry to transport its customers across the water while a footbridge is closed for repairs. Porthill Footbridge, in Shrewsbury, is to be closed from March to July to allow Shropshire Council to carry out refurbishment work. The bridge, which crosses the River Severn, between the Quarry and Porthill, also allows people to reach the Boathouse Pub which sits on the opposite side of the river to the town park. To avoid losing customers, the pub has agreed to part-fund a ferry across the river, but finding original ways to cross the water to get to a favourite drinking haunt is nothing new in the county. 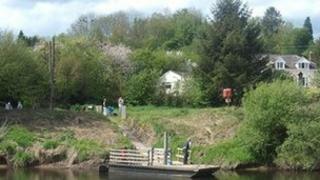 In Hampton Loade, near Bridgnorth, people have used a cable ferry to cross the River Severn for about 400 years. The ferry saves a 10-mile trip to cross the river and is a popular way for customers to visit the nearby River and Rail pub. Unusual river transport also played a part in the history of Shrewsbury Town Football Club. Fred Davies, a local coracle maker would sit in one of his boats in the River Severn ready to retrieve footballs that had flown out of Shrewsbury Town's old Gay Meadow ground during the course of a match. The coracle was replaced by an inflatable boat in 1979. Small boats are still popular on the river as well as more unusual forms of transport. Michael Drage, from Shrewsbury, is already used to visiting the Boathouse by water - he has used a pedalo to make the trip since he bought it about five years ago. He said: "It used to be on a lake in a park down south. I thought it would be the ideal form of transport. "In the evening the current is far less strong and it's like crossing a pond. "From where I live I can go upstream against the current to get to the pub in around 45 minutes. It takes about 30 minutes coming back with the current." He said his family used the pedalo for timed races across the river in the summer and to pick up a takeaway from a restaurant on other occasions. He added the reaction from customers at the pub had been good. "People love it, it's a bit quirky and a bit different," he said. Rivers are not the only barrier to cross in search of refreshment. The county is prone to flooding leading to one pub landlord devising a novel way to bring customers to him. John Bewley is the landlord of the Royal Hill Inn, in Edgerley. The pub is close to the River Severn and has been cut off by flooding on a number of occasions. Five years ago he bought an ex-French army vehicle designed to carry troops across rivers. The "flood bus" can drive through about 5ft of water. It was once used to transport people around a pheasant shoot but Mr Bewley bought it so he could leave the pub when the road flooded. He has also used it to help farmers reach stranded animals and helped the fire service rescue someone who drove into flood water and got stuck. "I was looking for a vehicle to get through the floods not thinking I could use it to get customers to the pub. "It was a bit of fun to pick customers up in it and it keeps the pub ticking over. We don't have to do it but we try to keep our customer base. "It takes 16 people comfortably." The Boathouse ferry, which is expected to hold 12 people and cost about 50p a trip, will be subsidised by Shropshire Council and The Boathouse Inn. Tim Bennett, co-owner of The Boathouse Inn, said he had been concerned by a potential drop in trade during the spring and summer months. He said the ferry would operate from about 08:00 to 19:00, making it accessible for people travelling to work or college. The scheme still requires approval from the Environment Agency but if given the go-ahead it will join the list of unusual ways people in Shropshire visit their local.